Montlake Bridge has been on our engagement shoot wishlist for quite some time and after chatting with Kiera and Max about locations and the vibe they wanted for their engagement photos, we finally got to make it happen. 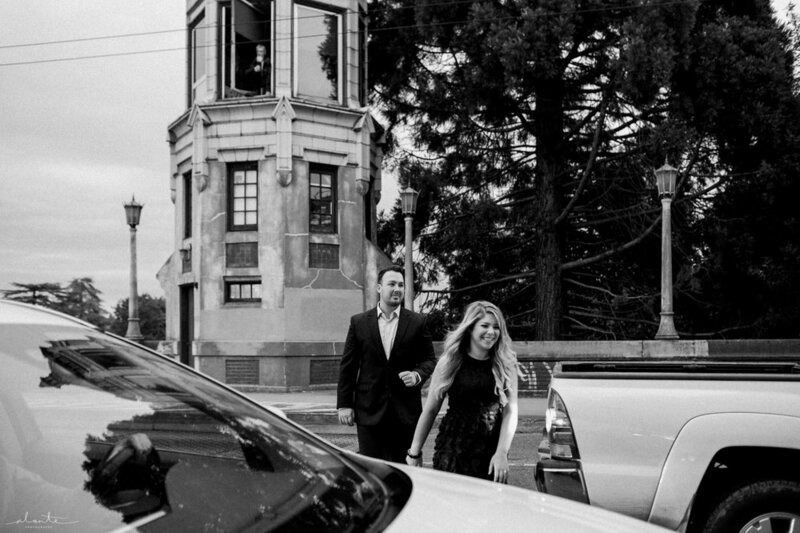 It's also a perfect choice as it nearly overlooks the Seattle Yacht Club where they will be married next year! 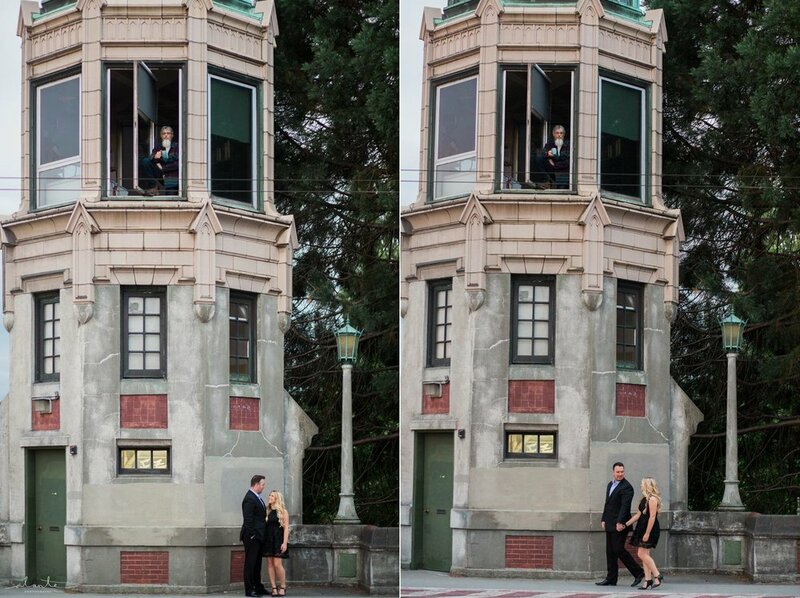 As we were posing for photos on the Montlake Bridge, the bridge operator who was working in the tower perched himself on the ledge of an open window and watched our session as he drank his evening coffee. We decided to cross the street to finish up the session on the other side of the bridge, but there were no crosswalks around and constant cars passing by. We stood for awhile waiting for a break in traffic to get a chance to run across to the other side, but before we did the bridge operator noticed and shouted down that he would stop the cars! He sounded the horns and turned on the lights as if the bridge was opening and every car stopped just for us to cross the street! 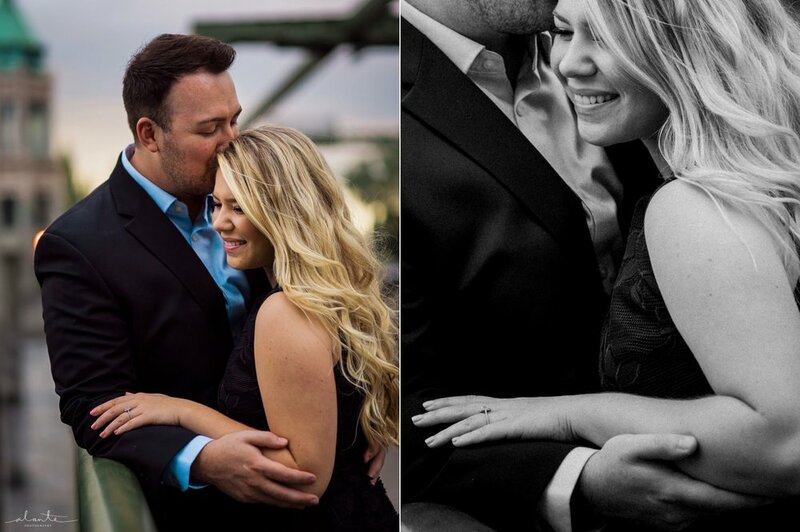 Enjoy their session and don't miss their engagement story after the photos! Max proposed to me at Columbia Winery last September! He had been on an out of town business trip and I had been working all week. He had just gotten a new job and early in the week he asked if I would be willing to go meet up with his new co-workers and their spouses at a work happy hour event on Friday when he got home. I said sure and thought nothing of it. Friday came and all I wanted to do was lay on the couch when I got home from work! I was half napping as Max was rushing and telling me to get ready (our usual get ready routine). We finally got out the door and made it to the winery. I sat in the car for a minute and said "do we have to?" he said "YES, it will be fun!" so we went inside. We checked in with the hostess and she led us to the very back of the tasting room and pointed towards a staircase that led down into a basement. I walked down first and we turned the corner and we were in a large empty room full of wine barrels. Straight ahead I saw one table setup with champagne glasses, flowers, and pictures. My first response was "Max, we just crashed someone's party we have to get out of here!" and he laughed and said "this is for you!" He proposed after that and I said YES! We enjoyed our champagne and he told me my second surprise was about to happen. As I'm trying to figure out what that might be, both of our families and closest friends walked down the staircase and into the room! We all enjoyed wine and appetizers and had a great evening celebrating! Best surprise I've ever had! I can't wait to marry my best friend!